It’s perhaps one of the most common script notes readers give, and something that can have the unfortunate effect of making the writer seem a little over-precious: don’t direct the script! This usually involves details of the location requirements and camera instructions such as SLOW MOTION, PAN, DISSOLVE, CUT and FREEZE FRAME. So what can you do to avoid these sorts of style faux pas? You need to INFER the directing, show rather than tell internal descriptions, as well as trusting your actors to do the actions and dialogues justice. Instead of “Close-up on X’s weathered hand, expertly spinning a pen” you could try “A pen expertly spins in weathered hands.” Essentially, we are telling the reader what they are looking at, without actually saying it must be a close-up – we’ve inferred it by being specific about the object. Instead of “pan across a vast forest”, why not give us something to focus on that isn’t just a camera direction? For example, “an eagle soars above the never-ending forest treetops” is much more visual and interesting. Instead of “X looks angry”, have X do something to show it, like kicking a bin. Instead of stating there’s a pause, infer the wasted time. If X is waiting for an answer from another character, he could impatiently encourage the answer through dialogue. If X is pausing himself, then you could show him getting distracted by something in the location or changing the subject (avoidance). Descriptions can often come across as wooden and repetitive, so the above methods need to be used to create a more concise and entertaining read. For example the following description feels like a list of “he does this, he does that” and tells us how X feels instead of showing us. We have camera directions and there’s the dreaded “suddenly” word. We can do better than this! 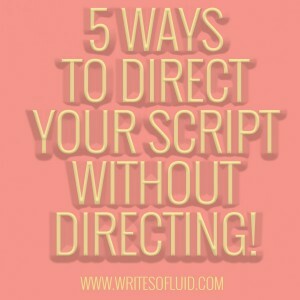 TO SUMMARISE: cut as many forms of directions as you can, trust the actors, and if you must direct the script then infer them and be sure to write your action descriptions in interesting and entertaining ways.